To me, it was a bit perplexing to see the iconic Teahouse in Stanley Park renamed Sequoia a few years back. After all, there are many people who have fond memories of the Teahouse and a name change just didn't seem right. Fortunately, the decision was to revert back to the name we are familiar with. Of course, change can be good as well. Recently, Francois Gagnon, formerly of Blue Water and Cin Cin, has taken the reigns as Executive Chef at the Teahouse. Tonight, I was invited to give the Teahouse a try. I've been here when it was known by it's original name and while it was the Sequoia. This will be my first time back sin ce reverting back to the Teahouse. I arrived a little early and took a seat while waiting for my table to be setup. During that time, I sipped on a Candy Apple Martini. I was shown to my table and ironically, it was the same table I sat at last time I was here. Although, that time, I was dining with Viv. No Viv this time, it was just me, in a corner, snapping photos of my food. Thank goodness the staff knew exactly what I was doing. I don't know about you; but if I were a third party, I would be a bit disturbed at a guy sitti ng in the corner snapping photos of his carpaccio from many different angles. 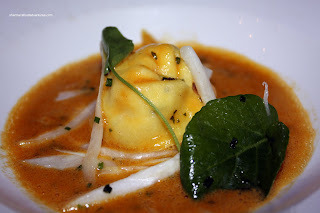 "He seems a bit lonely with his pounded raw meat..."
Before the carpaccio arrived, I was brought a amuse bouche in the form of a Dungeness Crab Tortellini with lobster reduction. The tortellini itself was al dente filled with fluffy crab meat. It appears this was a study in aromatics and natural sweetness since it was very lightly seasoned. The lobster reduction was rich while successfully taking a backseat to the crab. I enjoyed this very much and could have ate a whole plate of them. Appearing next was the plate of Beef Carpaccio, which in fact, I did take multiple pictures of... If you look at the picture, it seems to be a lot of things going on in one plate. You have the beautiful beef underneath truffle mayo, fried onions, pecorino romano, quail eggs and microgreens with a splash of olive oil. Combining all of the ingredients into one bite yields buttery soft beef combined with the saltiness of the cheese, smoothness of the mayo and crunchiness of the onions. A wide range of textures, flavours and aromatics are encompassed into every bite. 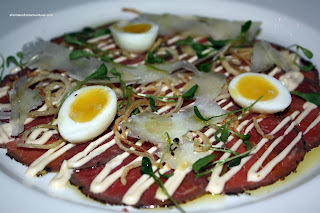 Although I've had quail eggs with my carpaccio before, it seems a bit unnecessary since it doesn't add anything that isn't already present on the plate. It's quite possibly I much prefer the Japanese version of Yuke where it comprises of a raw quail egg atop raw beef. Chalk this up to personal preference. 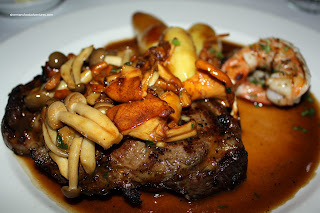 For my main, I selected the AAA Ribeye with wild mushrooms and fingerling potatoes (added 2 prawns as well). Nicely charred on the outside, the ribeye was perfectly medium-rare. I particularly liked demi-glace with the wild mushrooms. It was rich; yet understated so that the natural meat flavour remained the star of the show. The fingerling potatoes were firm while being fork tender at the same time - perfect execution. The only thing I would change are the prawns. Despite being cooked perfectly, there was a bit too much salt. 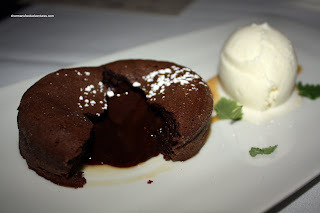 Finally, for dessert, I had the Molten Chocolate Cake. 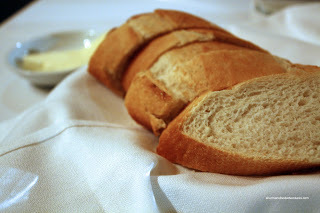 If you've ever tried the one at Morton's, this one is better. Piercing through the crisp exterior into the soft interior revealed a sinful gush of Grand Marnier chocolate ganache. I thought to myself, "I'll only take a bite". Guess what happened? One bite became the whole darn thing. Bad Sherman! I decided to call it a reverse chocolate souffle since that's what came to mind when I bit into it. I liked how the sweetest item on the plate was the vanilla ice cream since the chocolate was rich without being sugary. This was an very enjoyable meal. Of course when one doesn't have to pay for a meal, it's a bonus. However, I'll hold true to my belief that good food is good food, despite the fact they knew I was going to write an article about it or not. A bad restaurant doesn't suddenly become a good one overnight. 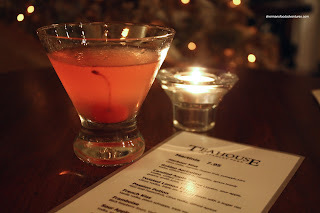 Besides, I've been to the Teahouse before (albeit with a different executive chef) and I liked it. This visit has not changed my opinion. "Bad Sherman", do you think? I mean you ate all that goodness by yourself and you didn't even bring your beloved Viv with you. I hope she made you sleep on the sofa that night. I would have been seriously bummed and less forgiving. I decided not to bring Viv because I don't want to take advantage of a good thing already. I like to stay conservative. I even tried to refuse wine; but they insisted! Shall I be the first to say ..what the hell?! "He seems a bit lonely with his pounded raw meat..."
Oh Sherman... next time bring me. :D I'll drink all the wine for you! And *tsk tsk* for not bringing Viv along. 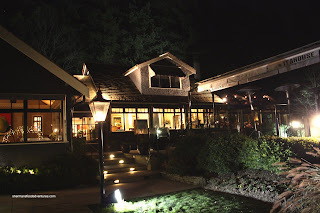 Went to Sequoia last year during the annual Dineout Vancouver. It was one of the pleasant surprises I could think of. Reasonably priced and good quality. I'm glad Teahouse name was the only thing that changed. Why'd they change it back? Yes, the molten cake was foodgasmic. LOL... Anson, I think they changed it back because people identified with the name Teahouse.